The Librairie Kléber bookstore, in the Aubette Shopping Arcade in Strasbourg, showcases a vast selection of books in their original language. Our books come from the four corners of the globe, with a strong focus on literature in English, Spanish and Italian but also Eastern European languages. Many other languages ​​also have pride of place in your Librairie Kléber in Alsace. We offer a loyalty card in the form of a smart card, allowing you to earn 5% on all your purchases. After 5 purchases, the credit earned becomes available and can be deducted next time you come into the store. Accumulated credits must be used up within one year after activating the card. 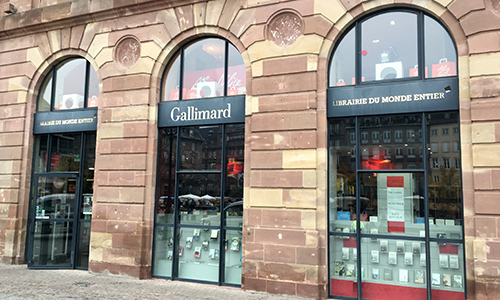 The Librairie Kléber, located in the Aubette Shopping Arcade in Strasbourg (67), also organises readings with foreign writers throughout the year.